One of the most flexible and unique research facilities in North America is sitting in plain sight, but near anonymity, on the west side of the University of Wisconsin–Madison campus. "When I tell people I work at the Biotron, they say, 'Oh, I've walked by that building a million times, and I never knew what went on in there,' " explains its assistant director, Isabelle Girard. " 'It seems so secretive, with no windows.' But it's really easy to understand what we do here, whether you're a part of the university or not." Here's the Biotron's big secret: It is whatever you want it to be (within terrestrial reason). Built by the National Science Foundation in the 1960s at 2115 Observatory Drive, the Biotron was designed to be able to simulate every climate on Earth except Antarctica. Scores of lab rooms spread across three floors can deliver temperatures from -20 degrees to 45 degrees Celsius (about -4 to 113 Fahrenheit), from 100 percent relative humidity down to nearly none, and light intensity from dark to half-strength daylight—which is more blinding than it sounds. There are rooms tall enough for growing trees, and rooms isolated from sound and vibration. There are even hypobaric (low-pressure) chambers whose thin atmosphere has provided the simulated circumstances needed to test devices built to administer accurate doses of vaccines and drugs at high altitude. That kind of flexibility has drawn in industrial clients from Harley Davidson to Parker Pen to Middleton-based Springs Window Fashions that subject their products to extremes and benchmark their performance in precisely monitored conditions. And it gives academic researchers the opportunity to design experiments that couldn't happen in conventional lab space – or without committing substantial time and money to one-off lab construction. "It's a researcher's dream in terms of organisms that are in an altered state," says Hannah Carey, the Biotron's director and a professor of comparative biosciences in the UW–Madison School of Veterinary Medicine. Carey studies the effects of hibernation on small, but surprisingly hardy, 13-lined ground squirrels, exploring how their digestive tracts emerge from the long hibernation season in ways that may help humans with digestive disorders. Her animals spend the warm months in a vet school facility. But when the days grow short and the animals are fat and prepared for winter dormancy, Carey moves them to the Biotron, turns down the temperature and turns off the lights. "They get comfortable right away, and we know they will stay that way," says Carey, who has conducted research in the Biotron for all of her 26 years at UW–Madison. "You can so carefully manage the experimental environment and without having to assign anyone to constantly monitor a thermometer or come in in the middle of the night to adjust the thermostat." The building has been revamped and updated in sections since 2012, making $7 million worth of leaps in efficiency and programmability. Where punch cards once ran the show, the works are now tied together by a computer system from Glendale-based Johnson Controls that can make precise alterations to temperature, humidity and other factors minute-by-minute and on a pre-set schedule. "Researchers working in conventional labs often set up their experiments in eight-hour increments, because they have people working in shifts," says Girard, "But that's not a restriction at the Biotron." The Biotron's top floor is a forest of heating, cooling and air-handling equipment, as each lab space has its own independent units grouped in a stack. That's a boon for researchers dependent on isolating their work, such as the Wisconsin Seed Potato Certification Tissue Culture Laboratory, which conducts research on potato-killing infections while also supplying seed stock for nearly all the publicly available varieties of potatoes grown in Wisconsin. 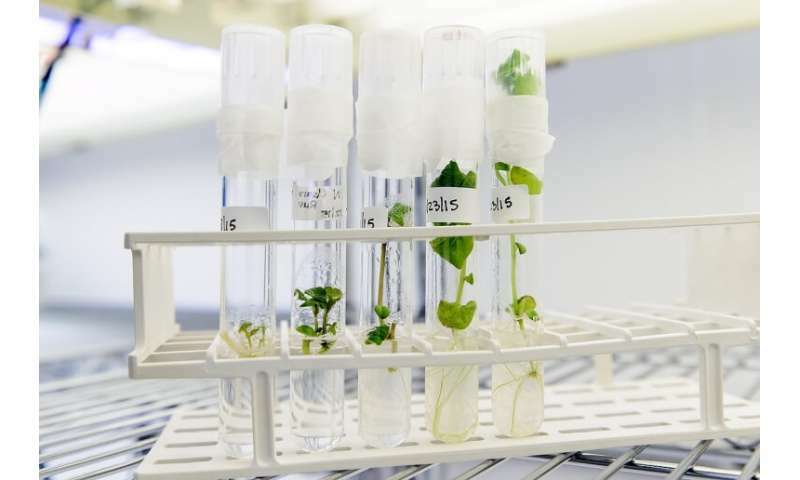 "It's fantastic for our cultures," says Andy Witherell, manager of the lab and its Biotron rooms full of tiny potatoes budding in racks of test tubes. "Our contamination rates are so low and we can watch the plants progress without worrying about the lab environment introducing problems." Tim Yoshino, a UW–Madison professor of parasitology, relies on the Biotron to help him keep his research subjects separated from each other. Yoshino studies a microscopic flatworm called Schistosoma, a blood parasite that infects hundreds of millions—and kills hundreds of thousands—of people every year. The flatworm's larvae live in another host, a short list of freshwater snails that live in the tropics. They like their water at a nice, steady 26 degrees Celsius (close to 80 degrees Fahrenheit). And when they're comfortable, they start making baby snails. "Snail embryos are 1 mm long, and cling to anything—food, plants, gloves, tools," says Yoshino, who has worked in the Biotron for more than 15 years. "So there's always the chance in a lab that you're going to contaminate a tank of one type of snail with another." 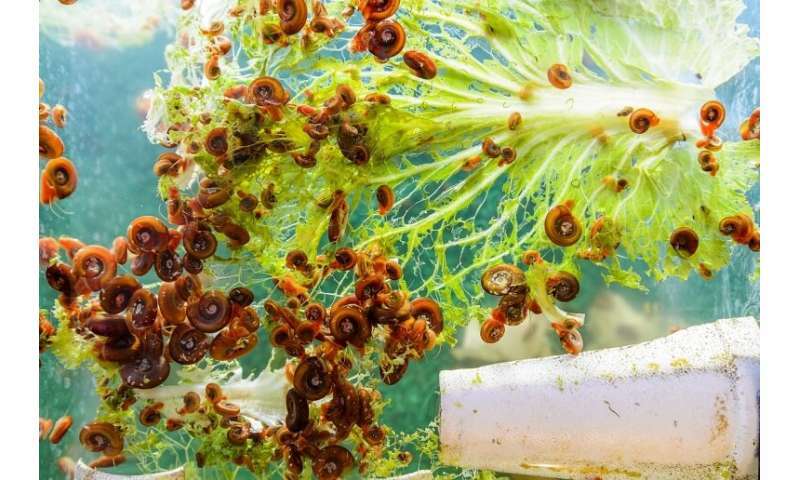 The snails are also hermaphroditic, capable of reproducing with male or female snails of other species, so all it takes is one tiny invader in the wrong tank to upset an experiment. "Because the Biotron has rooms in a cluster that can be so completely separated from each other, we can raise different strains of the same host—the same snail species, but with genetic differences that affect the way they react to the parasite—in the environment they like, but safely apart from each other," says Yoshino. "It's very manageable and efficient." And that could help Yoshino and others find away to disrupt the worm's life cycle and spare so many the complications of infection. Lights in many of the Biotron's labs and greenhouses can now be tweaked to simulate a broad range of conditions. 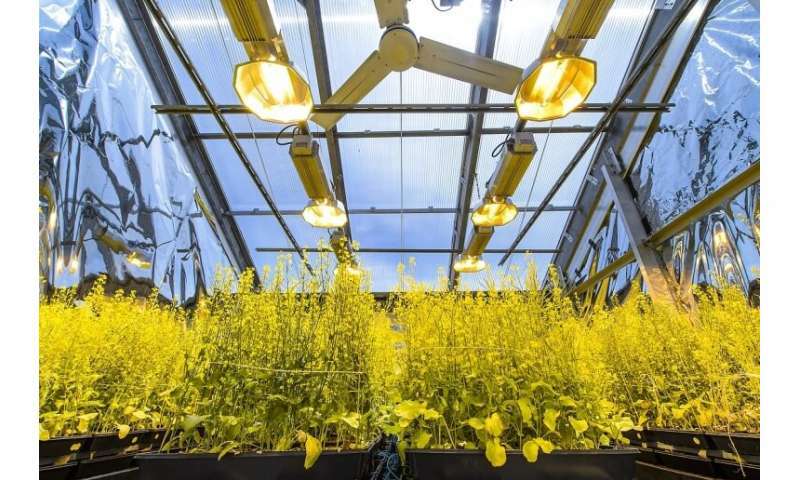 Wisconsin Fast Plants, an education program that provides rapidly growing plants for school projects on genetics and plant development, has been growing generations of their Brassica plants to select the ones that do best under LED light—a cheaper and easier way to fit them into a classroom. "We can provide different wavelengths of light, too, to simulate the light that passes through snow cover in the winter or filters through the forest canopy," Girard says. The range of overlapping and shifting adjustments the Biotron staff can design for researchers is so broad, it often doesn't occur to the scientists as a possibility when they design their studies. Girard and Carey wish more labs would consider the Biotron for their work, as the building is open to work from campus and beyond, both public and private. "We talk to people who say, 'Oh, I would have done a different experiment had I known this environment was available,' " Girard says. "That makes us proud, in a way, to know the impact the Biotron has. But it also makes us wish more people didn't think it was so mysterious."